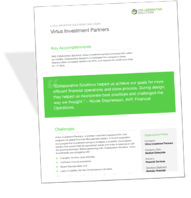 With Collaborative Solutions, Virtus Investment partners achieved ROI within six months. Collaborative Solutions consolidated the company’s siloed financial data, increased visibility into KPIs, and reduced its month-end close by 1-2 days. SPI Research examines how consulting firm Collaborative Solutions achieved more-effective planning and execution through Workday Professional Services Automation. 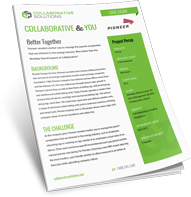 PSA helped Collaborative gain real-time visibility into the organization, improving planning, sales, and service execution. reporting capabilities. Enter Workday and Collaborative Solutions. 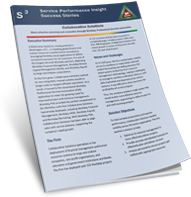 Brown University needed a financial management solution that went beyond the basics of accounting and would focus on strategic insights and high-speed performance. They chose Workday as the solution, and partnered with Collaborative Solutions for deployment. WNET needed a single, unified solution to manage its finance and HR functions. They chose Workday as their new HR and Financials transformation system, and selected Collaborative Solutions to lead the phased deployment. Renaissance Capital needed to consolidate its eight global offices to a single HR solution. Collaborative Solutions helped the global financial firm consolidate to a single, unified platform, increasing its functionality on a flexible, scalable platform. Facebook faced big challenges matching company growth with HRIS system abilities. Collaborative Solutions implemented streamlined business processes while allowing accurate monitoring and management of compensation, job profiles and a changing organization. Flextronics needed a way to simplify and centralize its HR operations. Collaborative Solutions helped to standardize their global processes and empower workers to take responsibility for their own benefits with employee and manager self-service. CareerBuilder needed to streamline its HR processes. Collaborative Solutions helped CareerBuilder.com meet the challenges of growth and expansion with Workday.